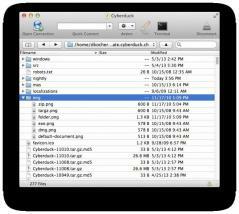 Cyberduck is a straightforward, open-source FTP client that supports FTP, SFTP, Google Cloud Storage, Amazon S3 and various other connections. It lets you download and uplod files, connect to remote hosts, create bookmarks and set bandwidth limitation. The program’s layout is modern, intuitive and very well-organized, allowing you to search in the directories stored in a server through browser-like actions such as the „back” and „forward” buttons. You can quickly create a new connection by choosing the connection type and based on your selection, Cyberduck will provide several related parameters that you can configure. It also lets you save your frequently used connections as bookmarks for quick access via the built-in bookmark manager. There’s also a history panel with a built-in search function, in which you can see and connect to any connection you’ve previously used. Downloading/uploading data can be performed with a few clicks and various options like resume, reload, stop/remove, limit bandwidth and open the output directoy are provided.